Online and mobile marketing experts, Michelle Duplechan & Jenn Foster, recently hit three Amazon.com best-seller lists with the new book, “Video Marketing for Veterinarians.”Sandy, UT – Wednesday, February 18, 2015 – Michelle Duplechan, of Duplechan Marketing Solutions, & Jenn Foster, Founder and CEO of Biz Social Boom, recently joined the best-selling authors on Amazon.com. They are two of the nation’s leading experts on Video marketing. 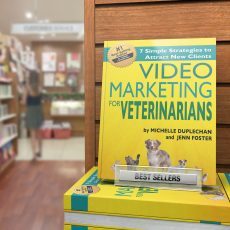 Together they co-wrote the book titled, Video Marketing for Veterinarians: 7 Marketing Strategies to Attract New Clients.